I have been a Harry Potter fan since the books first came out. I have a 20 year old son who was at just the right age for Young Adult books when they were published and he was at that time in his life an avid reader. In face he would often get in trouble in 4th and 5th grade for often having his nose in a book instead of paying attention to the teacher. (I probably should have realized this was an escape from school work that would show up later in high school in less positive ways) but at the time I was okay with having a great reader although of course being a dutiful mom I scolded him for not paying attention. This same son and I were such Harry Potter fans that we went to the bookstores at midnight when the books came out to buy them. I wasn’t quite okay with midnight movie openings because they were usually on school nights unfortunately but the books came out on Fridays or Saturdays and it became a special treat for us. We own all the movies and have all the books in both paperback and hardcover, and yes I can say we have a Harry Potter marathon movie day at least two to three times a year at our house. So you can imagine my delight when this brilliant man named John Jesensky created Cine concerts. This is a concert where a symphony plays the scores of movies while the movies are being shown on a big screen behind the musicians. 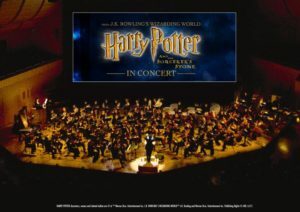 For me this is awesome because Harry Potter and the Sorceror’s Stone is being shown and played by the Virginia Symphony Orchestra in November in a town next to me. This is very exciting and I can’t wait to experience this. It will be both acoustically and visually stunning! Music Can Inspire Greatness! 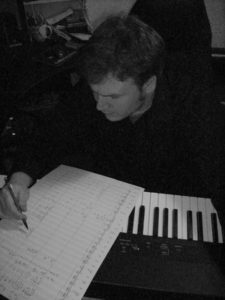 Mr. Jesensky is also a composer of music for over 15 films and has created a scholarship in his name. Young musicians face a highly competitive field and higher education is quite costly. Many times they drop out of music and pursue other career paths. Mr Jesensky has created a scholarship (The John Jesensky Music Scholarship) to support students. One student can receive $1000.00 to be used to help in their pursuit of musical higher learning. And the accolades don’t stop there. This man has dedicated his life to music and has won awards at events such as the Cannes Film Festival, L.A. Film Festival, Hollyshorts Film Festival, D.C. Film Festival, Phoenix Film Festival, Bare Bones Film Festival, and La Gona Film Festival. With such an impressive list of accomplishments and entrepreneurship, nit to mention his interest in youth and their attainment of a higher education in music, I am proud to be able to spotlight Mr. John Jesensky.